This email is only sent to subscribers. To subscribe or unsubscribe to this or our other email lists, email subscribePath@gmail.com, indicating subscribe or unsubscribe with the name of the email list. (3) We posted a new article, Underpayment of Pathology Technical Component, by Mick Raich, Vachette Pathology, on our Management Page. Click here for the article, or visit the Management Page from the link on our Home Page. (4) In the past week, we have been reading about and watching the news about the devastation in Haiti. As Pathologists and Laboratory Professionals, we know the great need for medical supplies and the medical care that is going to be required now and in the months to come. To learn more about where to donate, please click here. Thanks to Dr. Mohammed Sami Saeed, College of Medicine, University of Mosul, Mosul, Iraq, for contributing this case. To contribute a Case of the Week, follow the guidelines on our Case of the Week page. An eight month old infant presented with difficulty in feeding and shortness of breath.� X-ray findings showed a right upper lobe lung mass. 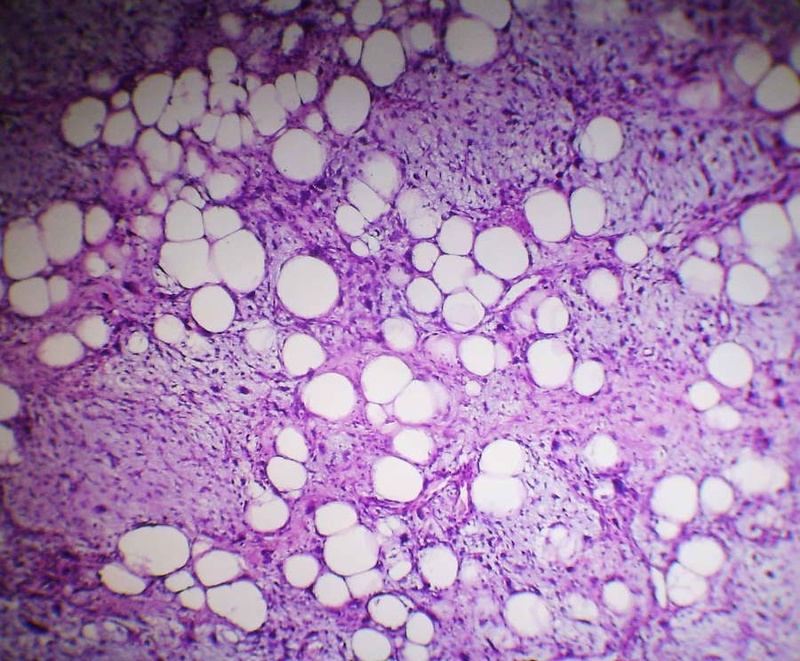 The mass was a large, solid, firm, whitish-gray lobulated tumor measuring 13 x 8 x 7 cm and weighing 280 gm. 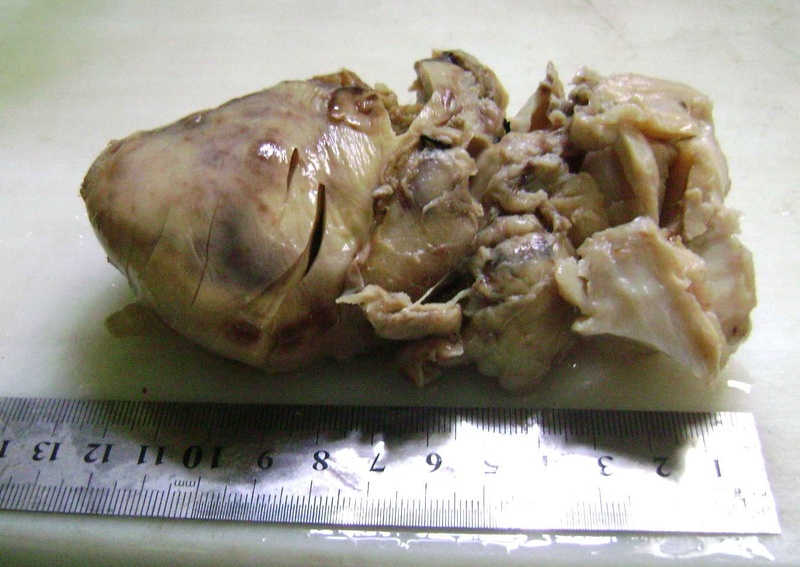 Cut sections showed foci of necrosis and cystic spaces. 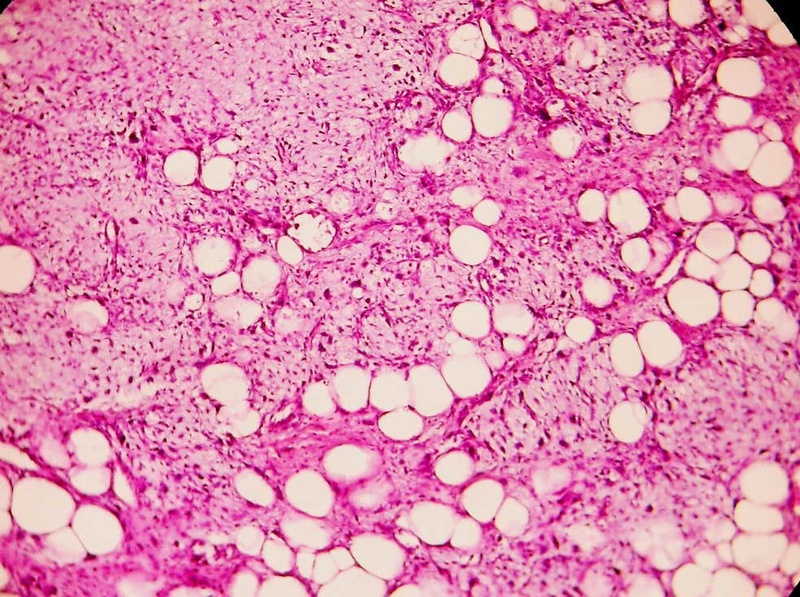 Microscopically, the tumor was composed of primitive, undifferentiated blastema cells and sarcomatous elements of different types of differentiation, including lipoblastic, chondroblastic, rhabdomyoblastic and giant cell undifferentiated sarcomas. Cystic and slit-like spaces lined by the primitive or sarcomatous cells were identified. 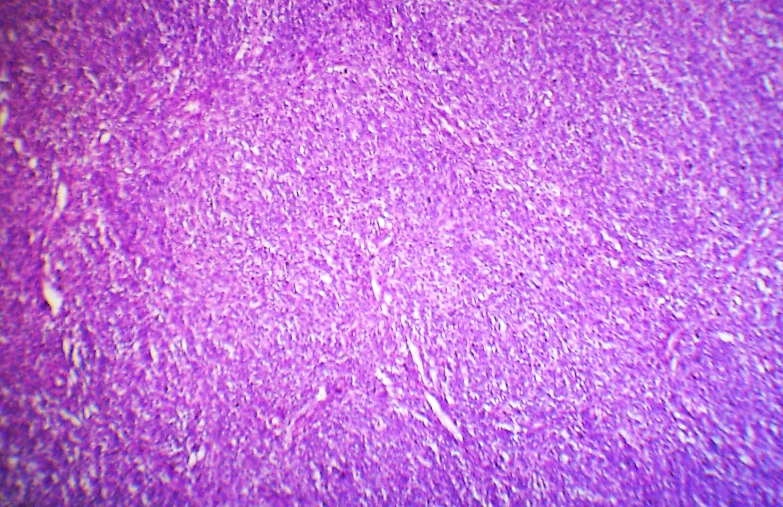 Multiple foci of necrosis were present.� These features are consistent with type III pleuropulmonary blastoma. Type I is multicystic, and may progress into types II or III. 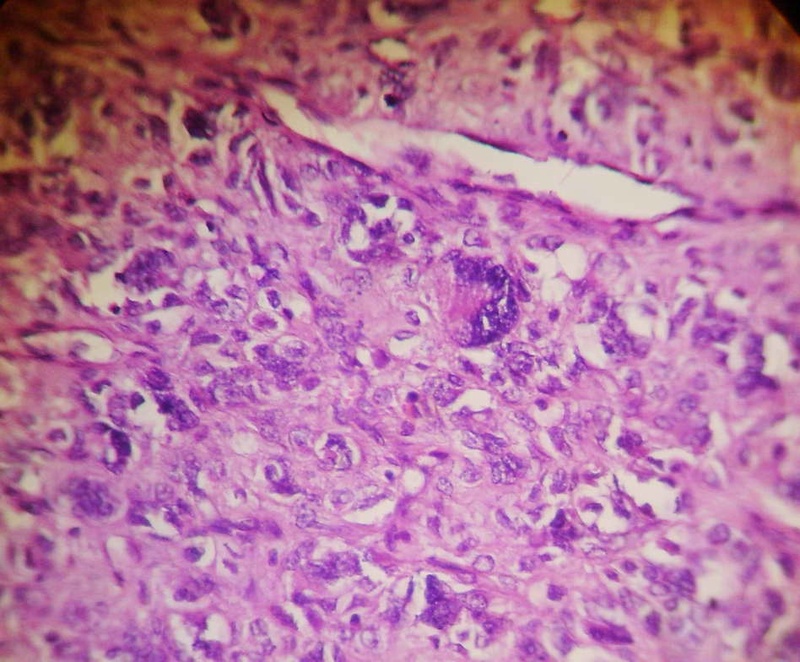 Type II shows thickened areas within the cysts. Children usually present with difficulty breathing or other respiratory problems.� MRI or CT can help diagnose, though biopsy is suggested (Pediatr Radiol 2007;37:337).� Microscopically, PPB shows mixed blastematous and sarcomatous appearance and primitive cells (Singapore Med J 2007;48:e190). 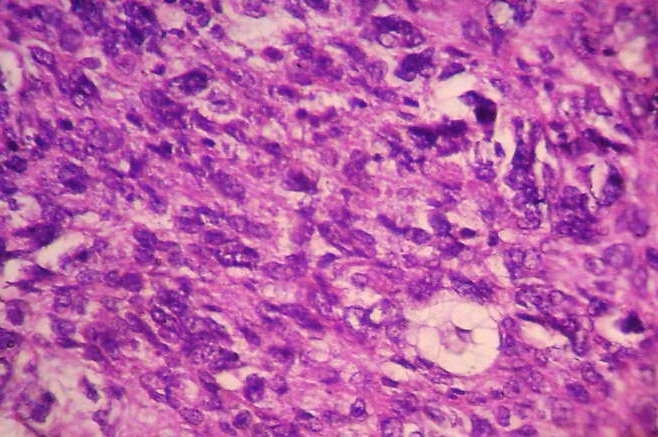 The differential diagnosis for type III cases is broad, because of the histologic variability. 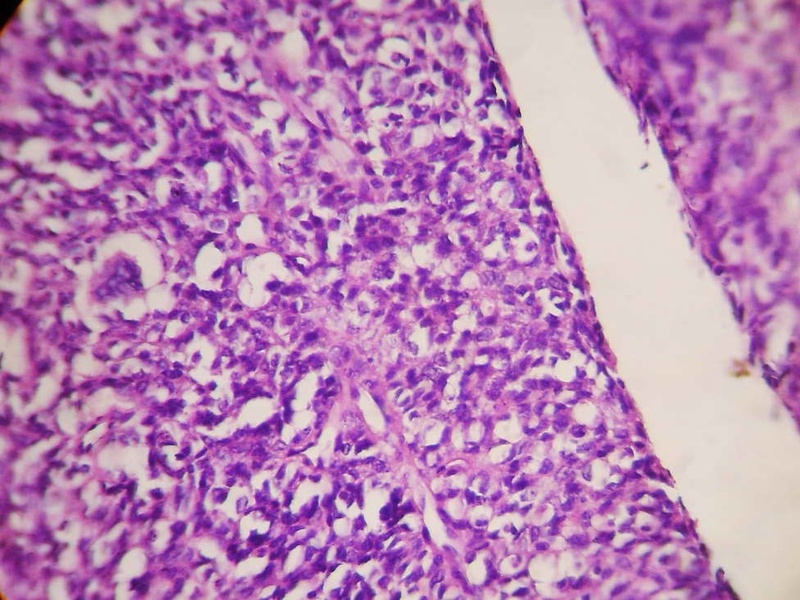 Many tumors may resemble embryonal rhabdomyosarcoma, but PPB also has cystic architectural, blastema tissue and other mesenchymal components such as cartilage. 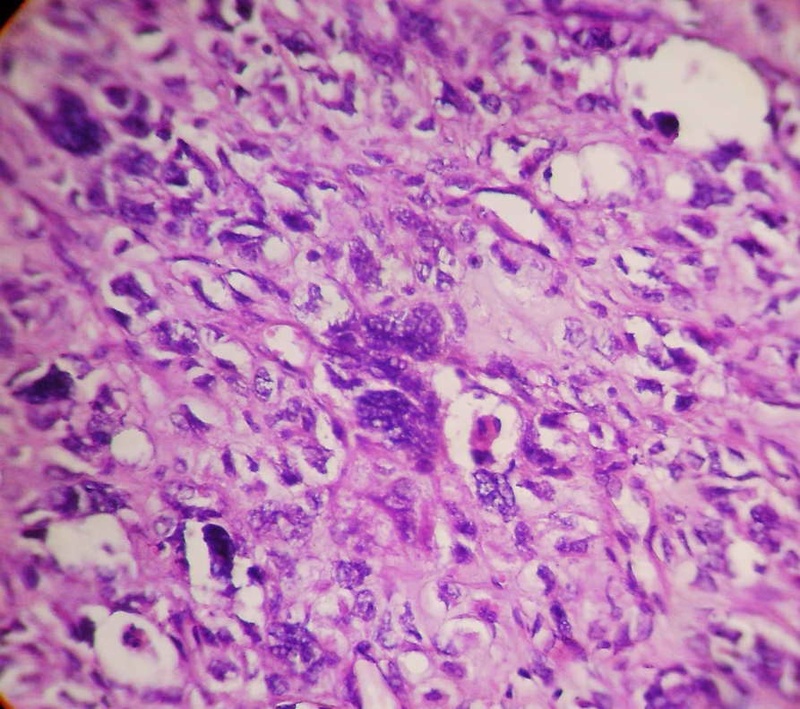 In addition, primary pulmonary or pleural rhabdomyosarcoma is extremely rare. 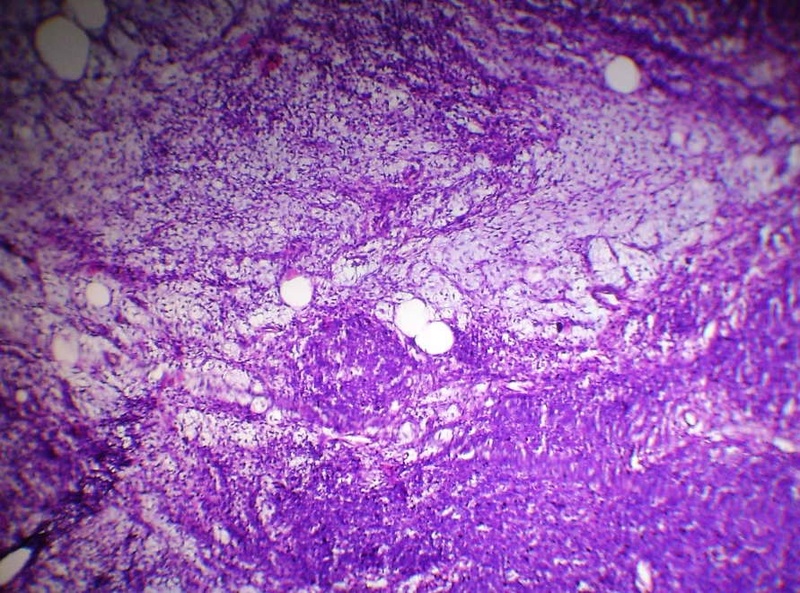 Other tumors to consider include monophasic synovial sarcoma, malignant peripheral nerve sheath tumor, mesothelioma, malignant teratoma and undifferentiated sarcoma. Immunostains are typically not helpful in differentiating these entities. A recent finding that may prove helpful is the frequent presence of gains in chromosome 8q in PPB (Mod Pathol 2007;20:1191). Treatment is radical surgery to excise the cyst or mass, with extensive follow up to detect relapses. Chemotherapy is usually provided for types II and III. 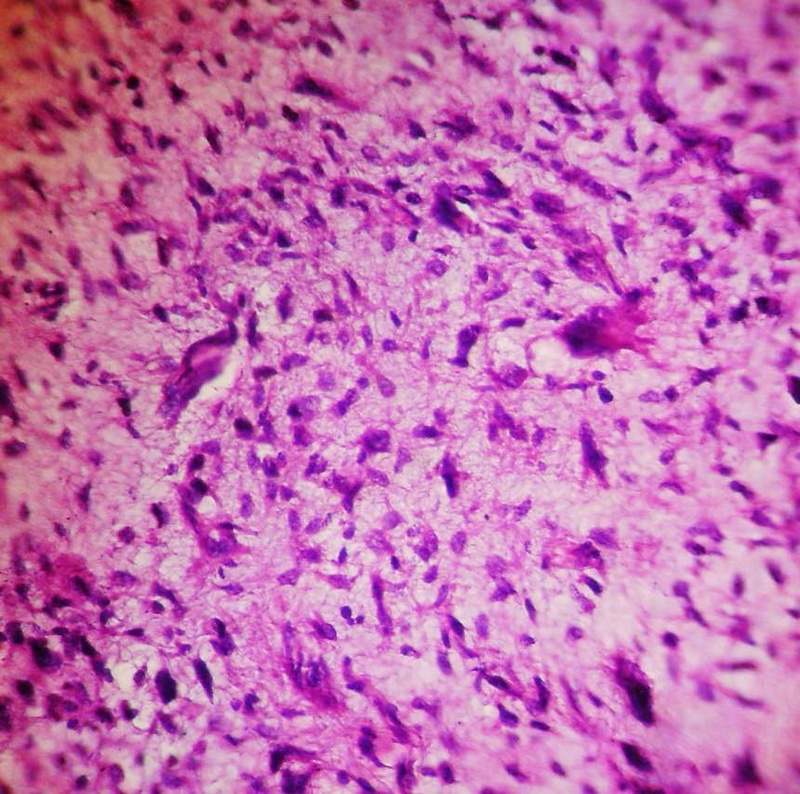 Half of patients eventually develop cerebral metastases (Pediatr Blood Cancer 2007;49:266).